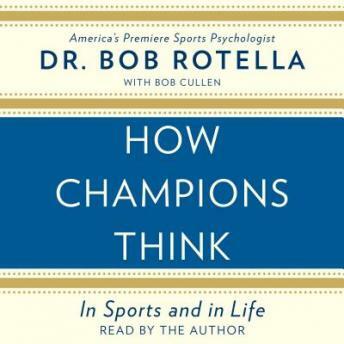 Listen to "How Champions Think" on your iOS and Android device. America’s preeminent sports psychologist delivers a groundbreaking guide to success in all aspects of life—not just sports—from business to relationships to personal challenges of every variety. Acclaimed sports psychologist Bob Rotella has advised everyone from professional golfers to NBA superstars to business executives on how to flourish under pressure and overcome challenges. Now, for the first time, he’s distilled his decades of in-depth research and practical experience into a potential-unlocking guide for everyone. This exciting book is not a collection of Rotella’s theories; it consists of performance principles that have proven themselves in countless competitive situations, in arenas from which only the strongest minds emerge triumphant. It’s a book full of insights that you can learn and use the next morning—in the office, the classroom, or wherever your quest takes you—told not in abstractions, but through case studies and stories drawn from Rotella’s years teaching sports psychology, counseling athletes, and consulting for Fortune 500 companies. It explores how to keep the mind from holding you back, whatever your physical gifts or other talents. It’s about how to make a commitment, how to persevere, how to deal with failure—and how to train your mind to create a self-image that promotes confidence and accomplishment. Any successful life starts with how you see yourself. And with these pearls of wisdom from the nation’s preeminent sports psychologist, you can learn to achieve the success of your dreams. Despite all the golfing references which I didn\'t quite relate to. Bob drops knowledge bombs about mental strength, trusting your subconscious and focusing on performance processes. I really enjoyed this audio book and would highly recommend for anyone wanting to work on their mental game.